A few years ago, a good friend talked me into working at a craft show for a company which produces relishes, jams and jellies, salsas and pickles. I had worked many a trade show when I was in telecommunications and they can be completely exhausting and sometimes utterly boring. Working with MeadowCroft Farm is exhausting, but it is a blast, meeting virtually everyone that nears our booth and engaging them with conversation and sampling of our products. I only do this twice a year, when MeadowCroft is in town for a local show, and it's wonderful to see so many "old faces" I have seen show after show and the new ones I am certain we will see again at the next one. We have to be the busiest vendor at the show by volume and frequency by far, but I can't swear to it. We are either enveloped by shoppers and buyers or we are recovering - cleaning and restocking the samples and product - so I'm not able to truly make such comparison. Perhaps this is "proof in the pudding" or "pickle in the juice". Like so many other forms of food preparation we enjoy today, pickling began as a means for preserving food. Is it needed today with refrigeration and pasteurization available? Of course it is - it can produce downright delicious and nutritious foods. This is not to say any food that is pickled is simply more nutritious on the merits of pickling and the consumer need not be concerned with the nutritional value of the food itself. 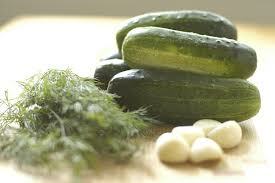 But, pickling in the purest sense, the fermentation of or to brine along with vinegar, without heat applied (cooking), helps retain many of the foods nutrients. And, with your savory pickled products, for which very little or no sugar is used, you may find nutritious value in the broth (sometimes referred to as juice - a misnomer). Brine does include salt so please consider this if you need a low-salt diet. If you choose sweet pickled products, they will usually contain sugars. Fortunately, most people do not eat pickled products at the rate or quantity as other foods because the tartness or sweetness is so pronounced (and delicious), satisfying our taste buds on a different level. When most of us think of pickles, the typical pickled cucumber comes to mind, but there are other foods which are pickled, such as okra, cabbage, green beans, limes and peppers just to name a few, but farmers and companies are beginning to produce a variety of new pickled products each year. However, vinegar, among its other benefits, although a negligible fat burner, does slow the digestion and absorption of carbohydrates, therefore increasing the odds the carbs will be used for energy and lessening the chances for conversion to fat. So, if you are averse to slamming down a shot of vinegar daily, you may just want to chomp on a nice crunchy savory dill pickle. Although I love pickles, I am not a big pickle snacker, but fortunately a pickled food can accompany most any meal in whole form, as a relish, chow-chow or sauce, while satisfying the savory and/or sweet palates and reducing the desire to overeat. Spending most of the time at the craft show, meeting and speaking with people, I focus on facial expressions and eye contact. This is a trait I acquired in the fitness industry, to increase the comfort level of my members (not doing the creepy body scan), to the point of being unconscious of it. However, I can easily surmise one's overall physique at a glance or peripherally. And, now that I think of it, I don't remember many of our craft show customers being obese. Was this cause or effect? Do the products help promote healthy weight or do healthier people regularly eat pickled products. Regardless, either case is a good thing. For additional information, click here, and remember, "Being in a pickle" is not necessarily a bad thing.